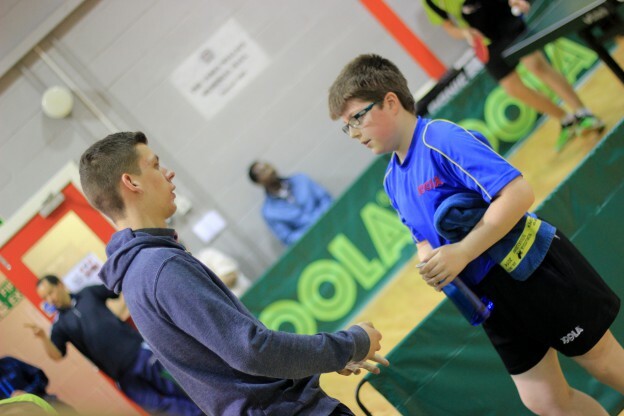 7 North Ayrshire players and coaches Chris Main & Andy Macpherson headed to Dumfries Table Tennis Club for the Dumfries Youth Open on Saturday June 6th. Very good and strong entry with 32 players travelling from Edinburgh, Glasgow, Bishop Auckland & Falkirk competing. Martin Johnson, Robin Wilson & Ryan Henry played in Band 1 and Jamie Johnson, Kayser Collins, Owen Wilson & Holly McNamara competed in Band 2. All our players showed great signs of improvement with their hard work in training paying off in matches. Pictures, draw & full results available here – https://goo.gl/tCnpnk. Band 1 – 3rd Martin Johnson, 12th Robin Wilson & 15th Ryan Henry. Band 2 – 3rd Jamie Johnson, 5th Kayser Collins, 7th Owen Wilson & 12th Holly McNamara. This entry was posted in Latest News on 16th June 2015 by Chris Main.